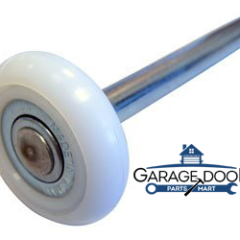 SKU: RL271-00-H Category: Garage Door Rollers Brands: Repair Parts. Please note: The old 13 ball roller was rated for max 75 lb load sections and 15,000 cycles. The new 11 ball roller is also rated for max 75 lb sections but passed 50,000 cycles. One key difference is the way the ball bearing race track is formed. The new wishbone design holds onto the tire a little better and helps keep the tire from coming loose – thus improved performance. But, less ball bearings can fit into this new design.